Hello, this is Captain Barry Clemente with an informational message. DPW will be working during the night due to the rain and flooding. They are available at 781-393-2445 and will respond to any flooding in the streets. If you have an emergency, call 911. Thank-you. I am not wishing for snow but our snow plowing company has not renewed our flat fee contract. Does anyone have a recommendation? If you pay by storm, can you share how that pricing usually works? Thanks so much! Happy HONK weekend! I believe I've truly captured the essence of winter 2015. 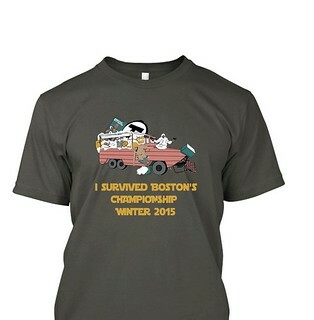 You know you need a shirt celebrating Boston's latest parade worthy championship: Snowiest winter ever. we've earned snow swag, right? I worked hard to design a shirt that truly captures all the crazy that has made this winter historic. Maybe if we all wear this shirt and parade down the street the snow will move on for the year. Long sleeve shirts and hooded sweatshirts are also available (since it may never be warm again). You can also feel free to share the link to the teespring campaign with anyone you think might like it, friends that have money to throw around, or just tell me what you think (I'll try to find some whisky or something to down before I read any comments... snow sensitivity and all that). Wasn't there a whole week of school closure in February, specifically to allow clearing snow from roofs? And the city was using drones to survey these roofs? I don't understand how this happened. 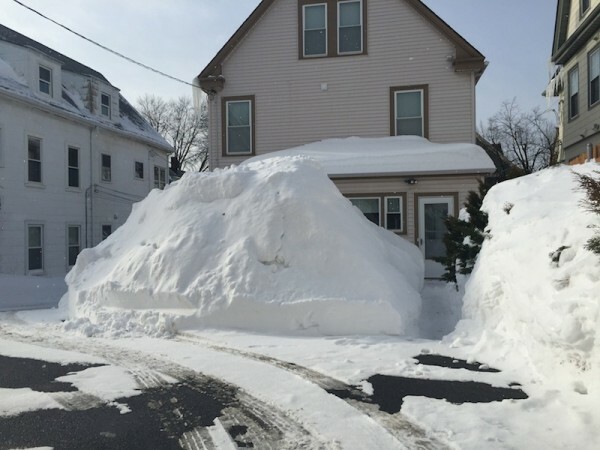 Looking to have a little fun with the epic snow we've gotten this year, we're running a contest on the Somerville Beat to guess when this giant pile will melt. The winner will get a $25 Union Square Donuts gift card, Beat stickers and, best of all, bragging rights! Enter by March 1 at midnight. Good luck! Public Hearing on Snow Removal Regulations Scheduled for Wednesday February 25th at 7pm. There will be a Public Hearing before the Board of Aldermen’s Committee on Legislative Matters on Wednesday, February 25, 2015, at 7 PM, in the Aldermanic Chambers, 2nd Floor, City Hall, 93 Highland Avenue, on the Order of Alderman Mary Jo Rossetti, Chairman of the Committee, for public input related to the city’s snow removal ordinance (Ordinance 2014-12, found at Chapter 12 Section 8). We've got some serious looking ice dams that are causing some water to come inside - eek! Can anyone recommend someone to remove them for us? I looked in the home services tag, but didn't find anything. Blessed be the shovelers, those of tired backs and aching arms, for through the sweat of their brows, we may walk. Blessed be the snow blowers, though their machines are noisy, because you can fit a stroller through those suckers. Blessed be the plow drivers, though you have just plowed in the end of my driveway *again*, because we know you working hard this month. Blessed be the fit young firemen who are digging out every one of this city's hydrants. Blessed be the neighbors who shovel and snowblow for their neighbors who cannot, because we're not all as able as we used to be. Blessed be Mayor Joe Curtatone and Jackie Rossetti from the City of Somerville, though they both sound kinda tired, for they are holding the city together. Blessed be Dr. Scott, who made the hard call to put safety over political expedience, though it meant my husband had to walk three miles to work this morning, because walking is still better than a derailment. Blessed be the bus drivers, though they may splash me with slush, because they will wait long enough for a young mother and toddler to climb over snow berms to get on board. Finally, blessed be the folks at 'Bucks and Dunks, dispensers of coffee and cocoa, because we couldn't get through this without them. I thought we could all use something upbeat this week! Hello, Davis Square Denizens! Do y'all know if businesses are generally open in Davis today? I wanted to start a post for "these places are definitely open," but it's possible they're all generally open, so I wanted to check. Thanks! The MBTA has announced that all rail and subway services will end tonight at 7 pm. No trains of any kind will leave Boston after 7 pm. "Very limited service" will continue on all bus routes, both Monday evening and all day Tuesday. Where does our snow go? There was an article on WBUR this morning about Boston's snow farms and my daughter asked me "Where does Somerville's snow go?" and I realized that I have no idea. Makes me fell like a bad citizen. Anyone know? Star Market - one lonely young guy manning one checkout line. I don't think they ever closed overnight. Dunkin Donuts - may be the only place to get coffee around here today. A long, slow-moving but appreciative line. Give them a nice tip if you go there today. The 7-Eleven at Mass. Ave. and Day St. was closed and locked when I walked by it. I didn't know they even had a lock for their front door. This is not necessarily a complete or exhaustive list -- feel free to add to it in comments. I walked only down Elm St to Porter Square and Mass Ave back to Davis, not down Highland Ave or College Ave or Holland St. So haven't ventured away from my sidewalk and shovel just yet. Are things open in Davis? The entire MBTA system is shutting down all day tomorrow. I don't understand this decision. During the Blizzard of '78, at least the underground parts of the T were kept open throughout the storm, as was the Longfellow Bridge crossing. If the state wants people not to travel on the roads tomorrow, shouldn't the T be kept open? I'm disabled and can't shovel, so every storm is an issue for me. My landlord shovels the walkway, but I could use help shoveling my car after this week's (or any) blizzard. I have neighbors and friends who have been very helpful in the past, but several of them have moved farther away or need to be home with their kids, so I'm running out of people to impose upon. If you're looking to do a good deed and get a little exercise, please let me know! If you can't help this week but might be able to after another storm (because this is Boston, so today's won't be our last of the winter!) please let me know. It's been bad for years, but the Davis Sq lofts area of the bike path is almost unusable these days. There is just a huge pile of accumulating mud that is unavoidable. I love the bike path, but it's getting to the point where I take a different route now. Does anyone know anything about plans to fix it? no-fun-nicole.livejournal.com - I believe I've truly captured the essence of winter 2015.
courtney o&apos;keefe - Public Hearing on Snow Removal Regulations Scheduled for Wednesday February 25th at 7pm. genevra-mcneil.livejournal.com - Where does our snow go?